This book promises to simplify life & help make life fulfilling! Perfect for the age group of 14 - 22 as it addresses their most binding issues. Sujit Lalwani is a pass-out from NIT(K), Suratkal from mechanical branch. He has been through some of the best remarkable experiences in last eight years of his life through business, networking, international level conferences and competitions sandwiched between frequent inspirational talks inspiring masses day in and day out. He has been responsible for more than 20,000 underprivileged kids to be made computer-literate. He has had the humungous expertise of leading 8000 plus network of business associates. He has been the founder of revolutionary social ideas which are globally growing today such as 36meals.com which aims at eliminating hunger from the world under the banner of which already more than 10,000 meals have been donated to the needy across 25 cities of the world, IU-Youth 2 Children campaign through which thousands of government school students have been made aware of internet and opportunities in future after school by college-going students, IUNewspaperbag initiative which aims at having a greener, eco-friendly and better world by reducing the usage of plastics and providing an alternative of using newspaperbags instead and educating people on the same lines. Along with all these social entrepreneurial ventures Sujit Lalwani is also the founder of 'Inspiration Unlimited', a company which is striving hard to inspire masses towards pursuing their passion and to bring about a massive positive change in the society. He has represented India at international level conferences such as One Young World, Visit RUSSIA forum and Year Big Year travelleing across five different countries of the world and has had a chance to meet Sir Richard Branson (founder and owner of Virgin group of companies). He has travelled and addressed people across 300 cities of India, Nepal, United Kingdom, Switzerland and Russia. Sujit Lalwani is a serial entrepreneur who will be coming up with slew of companies in near future to serve the world. Finally, after multiple and perseverant requests by his fans and friends, he has come up with his first book to reach out to all those who need his advice and guidance towards a glorious life and this book is titled as 'Life Simplified!'. After reading all these, if you are imag-ining my mentor to be with ages of experiences behind his back, let me surprise you by letting you know that he is just 25 years young. In this book 'Life Simplified! ', he aims at conveying the best lessons of life that he has realised through his stupendous journey throug various ventures in simple words which can have immediate positive impact on your life once implemented. When we asked the author what he has to say about his book, he said, this is a short book based on a very unique idea of his which he came across as he looked back into his past of reading. It's interesting to see a person who never liked reading transform into a person who has ended up writing one book himself. He went back to his past and realised not many of us are used to reading a complete book. He bought books, read about a ten pages and put them back into his shelf. That's exactly what most of us do and that's why he brought about this book which has a very unique structure. As they say, "You have to go against the norms" he tried compiling what is most powerful in the form of few lines that you could take away at a glance and the rest simplified into a very short content. He made it a short book because reading something completely is in itself a feeling of winning which this book tries to give through its name "Life Simplified". This book addresses the most binding issues of the people from the age group of 14-28 of 'What is life? ', 'What is its purpose? ', 'What is growth? ', 'What is Happiness? ', 'What is passion? ', 'What is determination? ', 'How do I know what is following my heart and what is not?'' and many such pressing issues. Sujit Lalwani recommends this book for the age group of 14-28 exclusively because he believes that's the age which needs the direction, the motivation, the drive and the clarity. 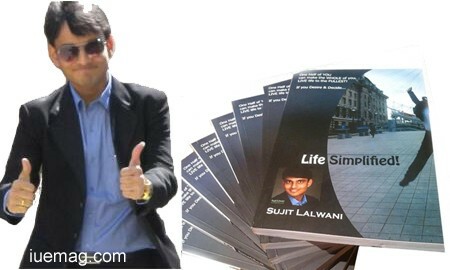 Purchase the book from www.lifesimplifiedbook.com & learn more about Sujit Lalwani at sujitlalwani.com.